Family Life Institute Blog | "The first role of family life is to love, to become a civilization of love"
"The first role of family life is to love, to become a civilization of love"
“Appetite is an active tendency or faculty which inclines toward a given object or end; the conscious striving for an end known either spiritually or sensorially. The appetite is moved by the presence of its object. Concupiscible appetite- the sensitive appetite that seeks what is suitable to the senses and flees what is evil to the senses. Irascible appetite- the sensitive appetite by which the sentient being resists the attacks that hinder its good or inflict harm on it. Thus, the concupiscible seeks the good and to avoid evil and the irascible is concerned with the obstacle to fight or flight. “A passion is motion of an appetitive power.” Passion is “a movement of the sense appetite, which follows the apprehension of the senses, and is accompanied by a bodily transmutation.” The name is derived from the Latin word “pati” which means to suffer or undergo, or literally to bear. “Passion refers an appetites reception of something in some way and the reception is an actual inclining or motion toward or away from some object. The “motion” of the appetite, brought us to the term “e-motion.” Passions occur with a bodily transmutation, i.e., the sensitive object causes some bodily change in the one undergoing the action.” This motion causes “bodily transmutation, i.e. chemical and biological changes which we identify as “feelings. A passion is the same thing as a feeling or emotion. The three terms are synonymous. There are eleven passions altogether, which fall under the heading of these two types. The concupiscible is divided into three couples: love and hate, desire and aversion (or flight), delight (or joy), sorrow (or sadness). The irascible, which arises from the concupiscible, has three groups: hope and despair, fear and daring (audacity), and anger. We are going to consider some of the passions as they relate to pastoral counseling. As we begin it is helpful to keep in mind that passions are stimulated by the imagination. Without any impression upon the imagination or senses there is no passion. They are in essence “blind” to anything but their one object. This will be discussed, as it is imperative to understand for many pastoral issues. III Sent., d. 26, q. 1, a. 1 and De malo, q. 10, a. 1, ad 1. Aquinas, Summa Theological, (I-II, Q. 22). Ripperger, Introduction to the Science of Mental Health, Vol. 1, p. 146. Fr. Chad Ripperger, FSSP, Introduction to the Science of Mental Health, (Sensus Traditionis Press: Denton, NE, 2007) p. 800. Fr. Chad Ripperger, FSSP, Introduction to the Science of Mental Health, (Sensus Traditionis Press: Denton, NE, 2007) p. 130. Ripperger, Introduction to the Science of Mental Health, Vol. 1, p. 188, See chapters 8 and 9, pp. 140- 216 for a necessary and sufficient discussion of the passions. What is contained has a bearing on every counseling situation. Summa Theologica, 1st part of the 2nd part, Q. 23, Art. 4. The habits whereby the human will and sensual appetites are under the control of reason to thus enable the person to act accordingly are called moral virtues. Simply, the human person has to be the master of his lusts. 3. All want the Truth since the intellect is made for the Truth. Man at times does not want the cost the truth brings such when it reveals his sin or demands sacrifice of some good that he desires. 4. All love the good because the will is for choosing the good. 6. The passions are not the deepest truth. They are simply desires, feelings and emotions. 8. Passions may work against right reason. Virtues enable one to overcome passions and direct them to what right reason dictates. 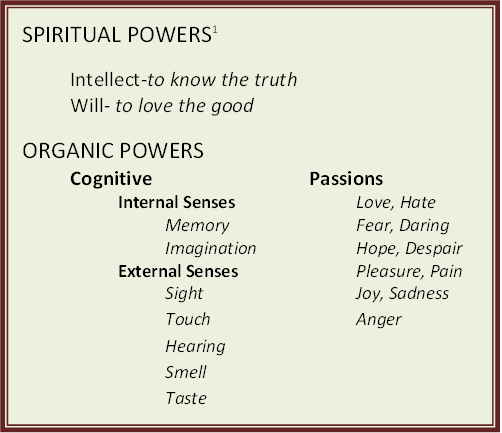 Look to the following chart and we find it demonstrates the powers of the human soul, which are common in animals (organic powers) and those, which are unique to the human soul (spiritual powers). The struggle for sanctity and happiness involves the struggle to unite the two powers. It is the ability to act according to right reason that principally determines a man’s character. The intellect’s object is to know the truth and left unimpeded will seek to know what is real and rightly ordained. However, it’s capacity to perceive the truth and reason has been obscured by original sin. The will can only choose good. However, the will is able to ignore one good in the favor of another or not consider a thing at all. Thus those goods of the senses such as pleasure or love may be contrary to right reason and yet still chosen because right reason is essentially ignored. Many people are naturally good listeners at least when they want to be. The naturally good listener has an active mind that summarizes what is being said. This common sense process may center on three simple questions that are very helpful to anyone who wants to be a better listener. This approach is a synthesis of the keys to attentive listening because they are contained in the attitude necessary to sincerely ask these questions. This question moves the focus from the listener to the speaker and what is being said versus what the listener would like to say. “Are the feelings what the speaker wants me to address?” The more the feelings are involved the more patience and understanding are required before a response can be made. The speaker must somehow come to know that these feelings are understood. What response does he/she want from me? This is the critical question that needs to be kept in mind because it involves the reason that the person is speaking to you in the first place. People always want to be listened to and to be understood. This must happen for other things to follow. It is the most important response to give. When both parties feel mutually understood tension and discord are diminished. This is true even when the two do not agree. The likelihood of anger erupting is greatly diminished. A priest used to tell the story of how his parents never got angry at each other. At first I thought him to be naïve. However, he proceeded to describe how they conducted their conversations. He said that his parents did something that he had learned to do during his courses in philosophy. One of the rudiments of philosophical discourse is obviously debate. A basic component of debate is that the first party states a position. Before the responding team could offer a rebuttal they had to first state the position of the first party clearly and faithfully. The first party would then acknowledge whether the second team was able to express the essential elements of the first position. Also, in debate, the first cross-examination can only contain clarifying questions. These are the questions that allow the first party to elaborate on points that the listener needs to better understand. After this process is done, the first party confirms the proper understanding and then the rebuttal or opposing position can be presented. It so happened that this young priest’s parents naturally did this. They always made it a point to understand each other before responding and making sure that their own understanding was consistent with what their spouse intended. As a result, even when they disagreed upon any point, neither party felt insulted because the other did not take the time to sufficiently understand them. People often want consolation and support. A burden seems lighter when shared by someone who cares. This combines with being understood to establish most of what people want most of the time that they speak about anything that is important to them. People sometimes want to get things out so they can see them more clearly. In this case people simply want to bounce things off of someone else. They come to get some order so that they can make a decision or get their thinking straight. When someone wants you to change your behavior or to perform some action then they will know you understand because they see the action. They may want you to act upon someone else. E.g. A wife who wants her husband to do something to change the behavior of their son. She will know that her husband understands when she sees that he has talked to his son. A person may want you to do something about your own behavior. E.g. A wife wants her husband to be more attentive or to do things around the house. She will know that her husband understands when she sees that he starts picking up after himself, doing the dishes, cooking, helping with the laundry and whatever other tasks may be on the list. How can a life that is so mysterious and bright be seen when it is blinding by nature? How can man express what is inexpressible? A consideration of the difficulty of man expressing himself and the things of God with words may be appropriate. It is understood by poets and philosophers alike that our words are limited when it comes to expressing the profound experience of human life. Lovers cannot fully express their love. The slighted cannot fully express their anger. So many of the secrets of our intimacy remain secrets because of their inexpressibility. However, there is nothing that goes so beyond our capacity with words as the experience of the transcendent God in the mystical life. Here even the literal words which come from the mouth of Our Lord contain meanings and depths that remain only partially understood and ultimately a mystery. His ministry was one of parables in which so much remained hidden from the wise. So much so that the apostles repeatedly asked Jesus to explain Himself. How many times did He tell them of His death and they would not understand? Just as Jesus gave His parables to bring the mysteries into a form that could be reflected upon, He also lived within the heritage of the Jewish people who had come to praise God with song and instrument. Basil Cole lists a number of such references from the Old and the New Testaments. The recitation of Scripture within the temple took the form of a chant; the psalms were all expressed in music. The place of metaphors and allegories are rich in the Jewish tradition. Music is pure metaphor. It makes us think of or imagine something, and when it is true, it sounds like something beautiful. DiVietri, Patrick J. Ph.D., A COMMENTARY ON THE CANTATA CARMELITUM, Dissertation presented to the faculty of the Graduate School of the Humanities, American Commonwealth University, San Diego, 1997, Pp. 11-12. Cole, Basil OP. Music and Morals. (New York: Alba House, 1993,) pp. 15-21. It is in consideration of the relationship between music and contemplation that we can more clearly see the role of music as a means to expresses things so difficult for words alone and aid in the formation of human beings. Music and morals are allied in principle. To listen to music is to contemplate something beautiful ….something eminently true since it mirrors the infinite beauty of God, Himself. The happiness which comes from true contemplation is often defused in art that is beautiful. It is this boldness that lives in the song of the musician. The boldness to sing out to God and demand that God respond in like form. At his best, the musician sings to God for his entire life in hopes that he might hear Our Lord’s sweet voice sing to him on the day of his death. But in truth God does not keep the artist only for that day but allows him to hear something of the melodies that await us all. DiVietri, Patrick J. Ph.d., A COMMENTARY ON THE CANTATA CARMELITUM, Dissertation presented to the Graduate School of the Humanities, American Commonwealth University, San Diego, 1997, Pp. 15-16. In Boethius. de Trinitas, 5,1, ad 3, De institutione musica, in Source Readings in Music History, selected and annotated by Oliver Strunk, (New York: W. W. Norton and Co., 1950), cited by, Cole, p. 74. Cole, Basil OP. Music and Morals. (New York: Alba House, 1993,) p. 59. Just prior to the life of Teresa of Avila (March 28, 1515 to October 15, 1581), according to R. S. Peters, the success of the sciences led to an overemphasis on mathematics and a rejection of the Aristotelian system of entelechy. Aristotle held that within the nature of being all human action moves towards an end. The final end is union with God which brings happiness after death. Another Aristotelian principle which was brought into peril was with the contingency of all creation. F. J. Sheed explains contingency when he discusses how everything exists because of something else which preceded it. The child exists because the parents married. The parents married because they met. They met because he got off the bus at the wrong stop and bumped into her, etc. Everything therefore existed because of God and only God exists independent of any other being, for He is the source of all being, the Prime Mover as the Pre-Renaissance Man would say. “Therefore the reason for His existence must be in Himself…there is something in His nature that demands existence…God must exist. This, then is the primary Truth about God. It was the crowning achievement of Greek philosophy in the fifth century before Christ.” The conclusions that all things are contingent upon God for existence and all human actions are predicated upon man’s essential nature moving to a specific end or good which ultimately is life in God provides the greatest insights of natural reason. By the 16th century, however, although God remained as philosophically tenable, the principle of all things moving towards Him did not. We will find that this is the essential goal of Teresa of Avila. She sought nothing else but union with God at all costs to herself. It was a movement of her total person from the core of her soul. She also saw that all things were dependent upon His grace. In the mansions of the mystical life this contingency is absolute. For Teresa the discernment, guidance and protection of these movements toward God and all human activity were dependent upon the Church. DiVietri, Patrick J. Ph.d., A COMMENTARY ON THE CANTATA CARMELITUM, Dissertation presented to the Graduate School of the Humanities, American Commonwealth University, San Diego, 1997, Pp. 25-26. R. S. Peters, Ed. C. A. Mace, The Encyclopedia of Philosophy (New York: Macmillan Publishing Co. & the Free Press, 1972), Vol. 7 p. 6. Entelechy is “the internal specifying principle that actively directs a nature to its specific good or end; hence, substantial form.” Bernard Wuellner, S.J., Dictionary of Scholastic Philosophy (Milwaukee: Bruce Publishing Co., 1956), p. 41. Frank J. Sheed, Theology and Sanity (Huntington: Our Sunday Visitor, 1978), pp. 23-25. It is interesting to note that Antonio Moreno, in his critique of Freud points out that his psychic dynamism lacks finality for only efficient forces are accepted by Freud. The dynamic theory of psychoanalysis, however, demands teleology…since it cannot be explained without finality. Antonio Moreno, Lecture: Criticism of Freud, Dominican School of Philosophy and Theology, 1987. Fidelity is living out a life-long promise to God and to each other to give yourself only to your spouse. The issue of trust it addresses, “If I give you myself, will you be faithful to your word?” Attentiveness to the beloved is the primary activity of fidelity. This counteracts self-absorption by turn one towards the beloved and seek the good for them more than themselves. Intrinsic within the good of fidelity is the unconditional statement, “no matter what you do I will be faithful.” When a bond is formed in marriage, infidelity does not break the bond. It is intrinsic in the vow that the intended fidelity is unconditional no matter what the person does. The witness of those who have been abandon and yet a life of fidelity is important to support and to point to for inspiration. Do you know of a married couple who divorced because one of them was unfaithful? If so, what do you think of what took place? If you were ever tempted to give up on the marriage because your spouse was unfaithful, what would you do? The vow states that such things as infidelity will be forgiven. How difficult would that be to do? What would be the greatest difficulty? How could counseling with a priest or marriage counselor help? In light of the place given to music by the philosophers of Greece we might also consider for a moment the role of music in Judeo-Christian history as expressed in the writings of the early fathers of the Church. DiVietri, Patrick J. Ph.d., A COMMENTARY ON THE CANTATA CARMELITUM, Dissertation presented to the Graduate School of the Humanities, American Commonwealth University, San Diego, 1997, Pp. 14-15. Homolia in psalmum,i., James McKinnon, Music in Early Christian Literature., cited by Cole, p. 54. Explanatio psalmi i, 7, ibid., cited by, Cole, pp. 126-127. De utilitate hymnorum,5, ibid., cited by, Cole, pp. 135-136. The Essence of Plotinus, (New York: Oxford University Press, 1934) compiled by Grace H. Turnbull from the translation of Stephen MacKenna’s The Enneads (London: Faber & Faber, 1956.) (First publication 1917-1930), p. 60. John of Salisbury, De nugis curialiam, Robert Hayborn, Papal Legislation on Sacred Music, 95 AD to 1977, (Collegeville: The Liturgical Press, 1979), p. 18. Cole, Basil OP. Music and Morals. (New York: Alba House, 1993,) p. 66. Nothing communicates love like ones full attention to another or the attentiveness, which notices a person’s needs and disposition. Understanding is always preempted in time and importance by the willingness to understand. One may not understand but their will to listen helps them to be attentive and make efforts, which edify the speaker. Open-mindedness is an important part of prudence and one must keep an open mind while listening even when disagreement is likely or already present. Without it the listener tends to close out the speaker and understanding becomes very difficult. One must control one’s own mind while listening in order to stay with the person’s reasoning. This means keeping emotions in check as well as not thinking about a response while waiting for a breath in order to interject. When we think about our response we tend to stop listening to the speaker. We think we understand because the words are familiar but the meaning may be different for the speaker than for ourselves. It is difficult at times for someone to find the words to express themselves. They may also be saying something that annoys us and patience helps us to listen. We must watch the face and body of a person while they are speaking. Much can be expressed physically that does not show in the words alone. It is not only what is said but also how it is said. Emotions may play a part and we have to consider the feelings that might be involved.